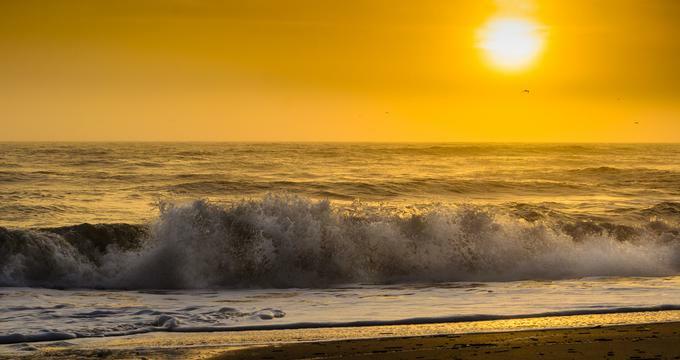 Flagler Beach is a beautiful beachside community located between Daytona Beach and St. Augustine in Florida. Visitors are greeted by long stretches of pristine beaches, a variety of appealing restaurants, cute shops, and a long pier with plenty of space for fishing. Several FL state parks and a handful of nature preserves are located just minutes from the downtown area, and there are plenty of areas for hiking, walking, jogging, and biking. Flagler Beach has its own municipal airport, but it is also easily reached when coming from Daytona Beach International Airport. 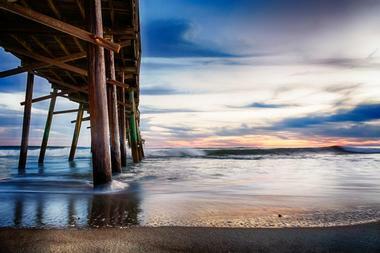 Ever since it was built in 1928, The Flagler Beach Pier has been a popular spot for sightseeing and fishing. The pier stretches 806 feet into the Atlantic Ocean, and it is open to visitors from 6 AM to midnight. Fishers can stock up on all the necessary supplies at the pier's bait and tackle shop. The pier is also home to a popular Flagler Beach restaurant called the Funky Pelican. Because of the pier's popularity among locals and tourists, there is a small fee for admission, and the rates vary depending on whether you are there for a walk or for fishing. The Gamble Rogers Memorial State Recreation Area sits between the Atlantic Ocean and the Intracoastal Waterway. The beach is the park's main feature, and guests often come here to swim, sunbathe, or fish. The park offers plenty of spots where visitors can have picnics or relax with family and friends, and overnight guests can stay in one of the park's two campgrounds. The recreation office located inside the park has canoes, kayaks, and bicycles available for rent. Visitors with their own watercrafts can use the park's boat launch ramp for easy access to the water. Bulow Plantation Ruins Historic State Park is a tribute to the sugar plantations that dotted East Florida during the mid 1800s, and this particular site was home to the Bulow family. They produced sugar cane, rice, cotton, and indigo. Now visitors come to the plantation to see what is left of their sugar mill and home. The park provides a boat ramp for easy access to Bulow Creek, plenty of room for fishers, and picnic areas that are ideal for family outings and group gatherings. Visitors can also walk or bike along the park's numerous trails. Prehistoric bones and dehydrated astronaut food are among the quirky artifacts that attract visitors to the Flagler Beach Historical Museum, which has a large collection of items that represent the history of Flagler Beach as well as the history of Florida. Photos, oral histories, and newspaper clippings give visitors a unique perspective of Flagler Beach's past. Community involvement is high since adults and children have plenty of opportunities to help with local preservation efforts through the museum's volunteer program as well as its many events. People who love the outdoors have plenty of options for keeping busy at the Betty Steflik Preserve. This 200-acre space has a long, scenic walking trail, areas for wildlife viewing and bird watching, spots for fishing, and a waterway for kayaking and canoeing. There is also a picnic pavilion that can be rented out for special events and gatherings. A family of five started the Flagler Beachfront Winery in early 2012. By building partnerships with grape growers throughout the United States, the Flagler Beachfront Winery is quickly achieving its goal of bringing Floridians unique flavors from all across the country. At the winery guests can buy wine by the bottle or by the glass. Tapas, flatbreads, and gourmet desserts are also available for purchase. Locals and visitors can join the winery's fan club for 20 percent off of certain wine purchases, free samples of new releases, and invitations to special events and classes. Miles of golden white sand, clear blue sky, endless expanses of ocean, pelicans diving for fish and palm trees swaying in the breeze. That is Flagler Beach, which offers you tropical Florida paradise at its best. And when you had enough of sun, shake off the sand from your flip flops and head to The Golden Lion Café for one of their famous cool cocktails and some of the best fish and chips you have ever tasted. Sit in your bathing suit at their charming tiki bar right on the beach or check the views from their picturesque upper deck. You can watch the dolphins frolicking, stately whales passing by and kids playing in the shallows while you are indulging in some fabulous margaritas, tart pina coladas or cool glass of wine. Whatever you pick from their extensive menu is excellent and super fresh. Their original key lime tartar sauce makes their famous fish and chips or battered shrimps an experience. And when the night falls and one of the great local bands or musicians step on the stage, you will know why the Golden Lion Café is a favorite of locals as well as tourists. Flagler Beach Farmer's Market is open year-round on Fridays and Saturdays, regardless of the weather. Oceanside Beach Bar & Grill is a family-owned business nestled up against the sparkling Florida coast. With a large patio that provides panoramic ocean views, a full service bar, and a selection of Italian, Greek, and Mexican fare, it is no surprise that the Oceanside Beach Bar & Grill is the top-rated Flagler Beach restaurant on TripAdvisor. The restaurant serves breakfast, lunch, and dinner, and the menu has an extensive list of freshly caught seafood dishes and plenty of alcoholic and non-alcoholic drinks. Down to Earth Pottery consists of a gallery, a pottery school, and a gift shop. Down to Earth offers four-week pottery classes for adults and children that cost between $115 and $125. Artists can also reserve studio time by the hour or per month. Additionally, parties and classes for youth groups can be arranged with the studio staff. Beautiful handmade gifts such as bowls, cups, plates, and jewelry are available to purchase from Down to Earth's website or in-person at the Flagler Beach studio. Funky Pelican is located directly on the Flagler Beach pier, and the endless ocean views and laidback environment make this restaurant a popular choice among visitors and locals alike. Guests can dine inside the restaurant or on the outside patio. The Funky Pelican serves breakfast, lunch, and dinner. Seafood as well as traditional Southern comfort dishes make up the majority of the menu options, but the Funky Pelican also has a wide selection of soups, salads, sandwiches, and burgers. The Gallery of Local Art (GOLA) at Flagler Beach has exhibited work by local artisans since 2007. The gallery is staffed completely by volunteers, and it currently has displays from more than 70 artists, including painters, sculptors, and photographers. In addition to its exhibits, the gallery also holds monthly events and classes for people of all ages. Watercolor painting, acrylic painting, glass mosaics, and jewelry making are among the most popular ongoing classes offered at GOLA, and these classes range in price from $20 to $75.